There are around 850,000 people in the UK with dementia, with numbers set to rise to over 1 million by 2025. Dementia is not an inevitable part of the aging process although the majority of people with dementia are over 65, with around 45,000 being under 65. Dementia is caused by a number of diseases that effect the brain. The most common is Alzheimer’s, different types of dementia effect the brain in different ways. Symptoms of dementia increase over time and everyone experiences the changes at different speeds. There is currently no cure for dementia but there are treatments to help slow it down or help people cope with certain symptoms. Here at the Leeds branch we invited Adrian Ellwood from Dementia Friends to one of our branch meetings, who gave us a full informative hour on understanding Dementia. How by having an understanding we can incorporate this into not just our workplace but into everyday life. Adrian explained how one of the effects of dementia is losing your perception, for example a black shiny tiled floor to ourselves we know is safe to walk on may to someone with dementia look wet and unsafe or a blue floor may look like water. Perhaps the entrance to your clinic has a mat at the front door a person with dementia could possibly see this as a large black hole. We also listened to the effect dementia has on the short term memory so remembering everyday tasks such as dressing they may forget the order in which to put their clothes on or the steps in preparing a meal. They may forget about safety like leaving on a cooker or not locking the door. Someone with dementia may start to act differently, getting easily upset or they may not be able to see or hear properly as the dementia has effected those senses. They may not be able to remember family or friends or enjoy doing things they used to like. They may struggle to tell you as a Chiropodist about their pain and may act differently if the pain is not treated. It is important to remember to have patience with the person with dementia and treat them with respect as ‘there is more to the person then dementia’. It is important to focus on what the person feels rather the what they can remember. 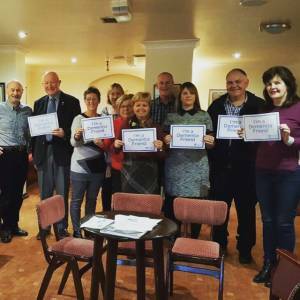 Become a Dementia Friend………..You can be a Dementia Friend and learn a little more about what it’s like living with dementia and having a more understanding of how to create a more dementia friendly workplace. Whether you have a session like us at the Leeds branch or watch a video it’s all about learning that even the smallest action can make a difference.